Where can I obtain information regarding the New York City District Council of Carpenters Welfare Fund’s compliance with the Patient Protection and Affordable Care Act of 2010? Where do I obtain a copy of the Participant Vouchers? It is a requirement of the Collective Bargaining Agreement that employers send Participant Vouchers to all participants once a remittance report is funded. 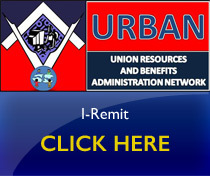 If you report via URBAN you can print the vouchers by choosing the option to view and/or print Participant Vouchers for each participant from a funded remittance report. Once the money has been cleared with the bank, the vouchers will be available for print. Who is responsible for the Working Dues/PAC for the members? The employer is responsible for deducting the authorized Dues/PAC via their payroll system and ensuring that the payroll deduction agrees with the URBAN remittance or manual check. For more information on Working Dues and calculations, please contact the Assessments Department of the District Council at (212) 366-7375. Where can I obtain information regarding complying with the disclosure requirements of the Financial Accounting Standards Board? How do I pay contributions through I-Remit? Go to https://ecommerce.issisystems.com/isite386/eremit.dll/386NY/logine.asp and see the URBAN Welcome Kit. How do I obtain a job number so I can report benefits? Call the District Council’s Job Tracking Hotline at (212) 366-7509. How can my company update its contact information? Contact the Employer Assistance Department of the Benefit Funds office at (212) 366-7386. What are the current wage and benefit rates for NYCDCC Carpenters? For information on current wage and benefit rates, please contact the Agreements Department of the District Council at (212) 366-7448. How do I obtain a copy of the Funds’ Collection Policy? Do the Funds charge employers for audit costs? The Collection Policy adopted by the Board of Trustees sets forth the circumstances in which employers are required to pay audit fees. Audit fees are only required if the employer‘s delinquency exceeds a certain threshold or if legal action is required. Where can I obtain a copy of my Collective Bargaining Agreement? If you need a copy of an Agreement or signature pages, contact the Agreements Department of the District Council at (212) 366-7448.